station near City Hall, to hang out with fellow commuters and have a free coffee. 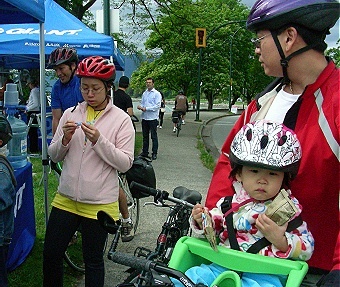 During Bike to Work Week, VACC had a record-breaking total of 50 bike commuter stations across Metro Vancouver. 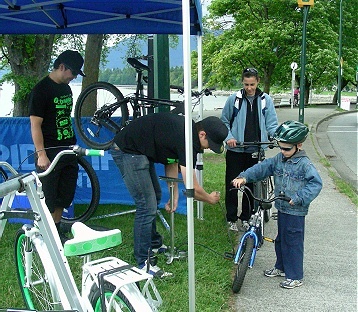 Though the VACC bike commuter stations were more oriented for adults with their information tables, the occasional cycling parent or adult dropped by with a child in bike seat, on a tandem bike or accompanied their cycling child, for a free drink, energy bar or fresh fruit. 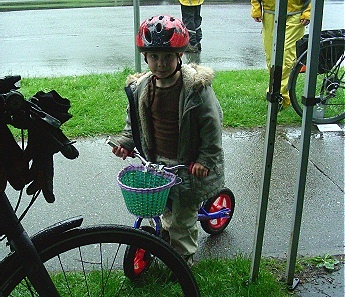 Contrary to any disbelieving parent, there are some children, though probably rare, who do cycle in the rain. At 2 out of the 3 commuter stations where I was, it rained intermittedly for several hours in the morning. 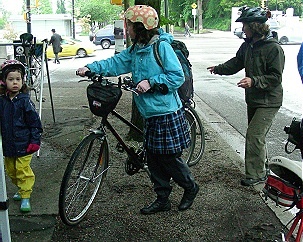 Nevertheless, these die-hard cycling parents had their kid in tow, warmly dressed and protected from too much rain. Some children were outfitted in rubber boots and rain gear. Only one teenager, a cycling young woman came with her younger sister and mother. But kudos to her. It’s rare to see teenagers cycling on their own for transportation. more to the point: are most drivers still conscientious and alert compared to decades ago? Maybe. At least awhile ago, we didn’t have dangerous driver distractions of cell phone use or texting. It doesn’t help either when there are many cars crowded near the school intersections to drop off children. After all, some of us can remember bike racks jammed with bikes outside our school. I did for my senior public school, grades 7-8 for children ages 13-15. The school was located along a 4-lane major commercial-retail street that was also coincidentally part of major local transit bus lines in an Ontario city, population of 40,000 at that time. At least the school backed into a residential neighbourhood for access to quieter streets. There was a university campus less than 1 km. away. No, parents didn’t allow me to bike to school because of safety concerns. But we walked to school daily. If the weather was particularily bad, I took the transit bus alone. The bus stop was only a 10-min. walk from home. There were other pedestrians and regular flow of car traffic. School was less than 3 kms. away. Focus on safe cycling facilities for children cannot be under-estimated. We want to make the experience for budding cyclists enjoyable, safe and help them cycle frequently, for health and fun. 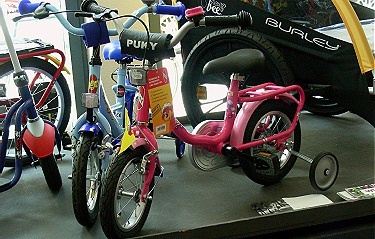 Most parents also want to instill safe cycling habits in their children. Danish children at the age of 6, are required to learn safe cycling skills at school. After all, for many adult cyclists who return to cycling at mid-life, the memory of childhood cycling fun can be that trigger to change adult lifestyle habits for transportation and health. With sufficient evidence of obesity and other related health problems, by building in cycling skills into the school curriculum and providing a good selection of built-in safe cycling routes for children, it will sow lifelong benefits.